After lunch, we were brought to Bikal port, a small port about 20 minutes away from Centro. There awaits our boat, San Antonio 2, which is by the way part of a group of boats owned by Lola Ason. So if you happen to decide to do DIY, get a boat from them because their boats are mostly new and the boatman and his assistant is so accommodating. They even have a boat for big groups. 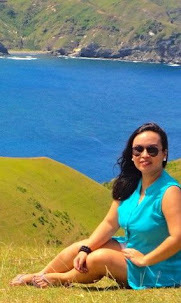 Our first stop: Matukad Island. Matukad Island is said to be the best beach island in Caramoan as it has the finest white sand among others. We were the only ones in the island. It is very, quiet and breathtaking. I just wanted to lay down on the sand and watch the clouds above. Seriously, I submitted myself to serenity for a moment. Although if you have been to Coron (my benchmark for "paradise" being the Malcapuya Island), you might find this island small. What I really like about Matukad is that it is very peaceful, unlike in Coron where you will batches boats coming in and out of the islands. Lahos means "lagusan" or "passage" because it is believed that boats can pass through the middle of the rock formations of this island before white sand has piled up and formed a sandbar. Look at the sandbar, it's like a hill of sand in there. I cannot even see the other side of the island from where I stand. This is my favorite island so far. the sandbar here might be short and small, but the waves here are calmer and the water is so clear! Plus, it is just across the luxury resort Hunongan Cove. We stayed here longer. We saw a lot of crabs at Kagbanilad Island. Here's Hunongan Cove where celebrities usually stays. Even former PGMA stayed here for a vacation. Then Kuya Antique, our boatman brought us here in a secret cave where the current is so strong that i did not even go to the end. But hubby did and took this photo for me. We initially wanted to have a day tour of Gota Village Resort (day trip is Php300/pax), but when we saw the shoreline, we said it is not worth it. The sand is darker and it looks like, well, a village, not a resort. But it is where the cast of Survivor from all over the world stays. The rumor is that Survivor India did not push through this year while Survivor US will occupy the resort the whole year next year. I am crossing my fingers that the rumor remains just a rumor. So that Filipinos will be able to enjoy OUR treasures. Our last stop is the Minalahos Island, the smallest shoreline for the day, yet the most mysterious. Why? Behind those rocks we saw another paradise.